Prior to the construction of the 6.5-m TAO telescope, we built a 1-m miniTAO telescope at the summit of Mt. Chajnantor, to provide first light observations using an optical CCD camera for engineering studies in March, 2009. Then, in June of the same year, we mounted the ANIR near-infrared camera on the 1-m telescope and succeeded in obtaining an image toward the central region of the Milky Way galaxy in the near-infrared hydrogen emission line of Paα (1.875µm), a first for a ground-based telescope. We mounted the MAX38 mid-infrared camera on the telescope in November of the same year, and succeeded in carrying out observations at a wavelength of 38μm from the ground for the first time. We will continue to observe a wide variety of targets in the future. ▲ The left picture shows the 1-m miniTAO telescope in the dome. The right picture shows the summit of Mt. Chajnantor; the white building to the right is the dome of the 1-m telescope. The near-infrared camera ANIR (Atacama Near-InfraRed camera) is mounted on the 1-m miniTAO telescope at the summit of Mt. Chajnantor, and is capable of simultaneous imaging in optical and near-infrared wavebands. 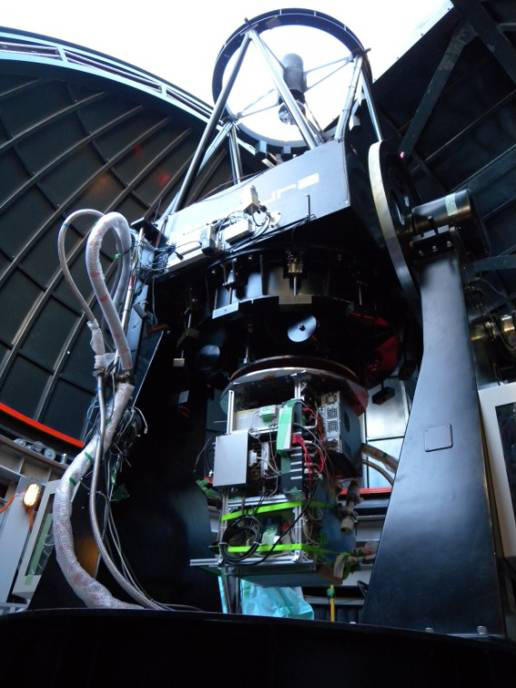 The ANIR on the miniTAO telescope enables us to carry out imaging observations using the near-infrared hydrogen emission line of Paα (1.875µm) that have been impossible in the past for ground-based telescopes. The Paα observations will unveil the true distribution of ionized gas in galaxies and resolve some mysteries of star formation. Moreover, follow-up observations of afterglows of gamma-ray bursts will be carried out to explore the distant universe. ▲ The 1-m miniTAO telescope and the near-infrared camera ANIR. The black-colored structure is the telescope, and the structure below the red disk is the ANIR. Mounted on the miniTAO telescope in June 2009, we succeeded in imaging the structure near the Galactic center revealed by the near-infrared hydrogen emission line of Paα (1.875µm). This was the first observation of Paα emission line from a ground-based telescope. 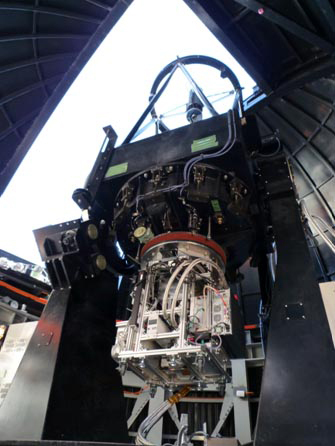 The mid-infrared camera MAX38 (Mid-infrared Astronomical eXplorer 38) when mounted on the 1-m miniTAO telescope at the summit of Mt. Chajnantor, is capable of observing in thermal infrared wavelengths (20-30µm). ▲ The 1-m miniTAO telescope and the mid-infrared camera MAX38. The structure below the red disk is the MAX38. The atmospheric absorption in the thermal mid-infrared is so strong that observations from ground-based telescopes have been impossible. However, in November 2009, we succeeded in measuring 38μm emission from the ground for the first time. More details for MAX38 are described below.